Conceptual art can be a hard sell, and Sumru Tekin's sound and video installation "One Day" is no exception. It doesn't help that the exhibition is tucked away in a dim room on the second floor of the BCA Center, with a heavy drapery partially pulled across its entrance. This theatrical touch helps keep the room dark, but it also can make you wonder if you're supposed to come in. It doesn't help that there is little in the way of explanatory wall text here. "One Day" is decidedly not dumbed down, almost to a fault. Perhaps there ought to be a warning sign at the door: This exhibit will make you think, and might make you feel a little uneasy. Video images of text that Tekin calls "fables" scroll constantly down one wall. The sentences are evocative but mysterious: Once there was a small house closer to the mountains and sky. Sometimes you can hear the ocean from here but not today... A small bench invites you to sit and let the words wash over you, experiencing what you will. Visitors to the BCA Center typically encounter a friendly greeter who cites the current exhibits and hands them a card or brochure for each. Tekin's consists of a single sheet of paper printed on one side with a rather ghostly image of a page from an old-school day calendar. This one contains the dates April 14 to 16, with a tiny inscription below indicating the year as 2014. Something was written on these days but has been almost completely whited out. One Day is based on the responses from sixty-five people to a letter from me requesting a memory of where they were and what they were doing during a specific date and time in 2014 — down to the second. It is, of course, an absurd and impossible gesture — recalling to the second what one was doing a year ago ... as seemingly absurd as an act of the imagination. An act of the imagination — as resistance against forgetting — an act of memory attempting to make visible an absent presence. 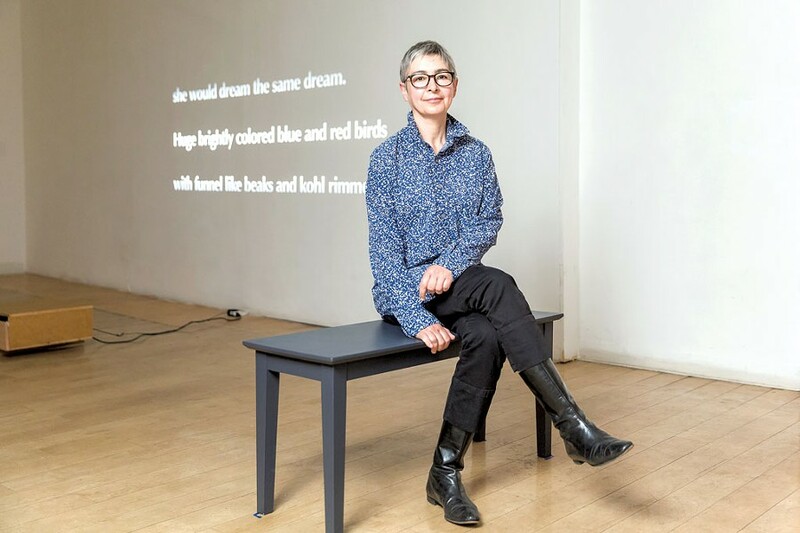 With that knowledge, visitors may be slightly better prepared to experience what Tekin describes simply as a 13-minute audio loop (simultaneous female voices making repetitious statements); a 30-minute video loop (the scrolling text); and "citations," 12 small sheets of paper pinned to another wall that note sources of inspiration for the work. The calendar page also appears framed and behind glass, like a shrine to a day both remembered and forgotten. Tekin was last year's winner of the Barbara Smail Award, an annual prize with a modest cash allowance, access for a year to BCA's studios and a culminating exhibit at the Church Street gallery. "One Day" hence represents, says Tekin, "what I've been thinking about for two years." Though she's known as a visual artist, Tekin doesn't provide "pictures" here, only text and sound, and she acknowledges that the work requires viewers to look, listen and digest. "I know I'm asking a lot of people," she says. Seven Days sat down with Tekin at the gallery to find out more. Why do you have overlapping, often simultaneous voices in the audio recordings? I wanted the sense that there's a collection of voices, and you can't really hear until you get close. I like the idea that we should encounter each other one on one, without the rest of the world. It seems as if there's something you can follow, but you really can't. It's a lot about history and who gets to tell the stories. All those things we've been told don't add up, either in memory or in history. This is how I imagined the concept. So you used your Barbara Smail time to work on this? Yes, and I went away for a residency [to the MacDowell Colony in New Hampshire] and thought about what this would be. I knew there would be audio, but I wasn't sure how to incorporate the text. In the studio I audiotaped myself, and ambient sounds outdoors. Then I started sifting through all this to see what I wanted conceptually. The kernel was, I wanted it to be some sort of text. How could I make reading a participatory experience, using your body? What would it look like for the room to be the "book"? Why did you white out the daybook entries? Part of the idea is, the content isn't as important as the voice. You have a day, a time — anything could happen. That's another, larger idea I'm still thinking about. The daybook page is fixed, a fossil with no memory, no context. In your exhibit, I felt a sense of loss. Can you speak to that? I'm Turkish, and the Armenian genocide is a fact of existence, of my identity that needs to be acknowledged ... I guess that's the loss — my sense that something is missing. The voice of the past is missing, or still saying something? It's insistent, but it's silent. I feel that's always [in] the work I do — an attempt to make something visible, to uncover. But I never get there. Meaning there's always more to uncover? Yes, I guess so. It's very important for me to find the right form or idea. That idea of representation is something I think about a lot. Is an image enough to open a conversation? To that point: Why create an exhibit with no images? It's that struggle to find the right form. I felt this [exhibit] is very close to the idea. And one thing alone wouldn't have been enough — the audio, or the text ... Maybe one day I will make another print, or do something [else], but it has to make sense, to have meaning. You're not in this for the money, are you? [Laughs] No, I guess not. Does it bother you that people might not take the time with your exhibit to understand it? The exhibit is asking a lot, but ... I hope people will take the time. It doesn't happen all at once, either. We're not accustomed to taking the time, even with each other. I love the music. These are three sonatas he wrote late in life. There are repeats within it, something concert pianists don't always play, so it doesn't get heard. Again, it's about silence. I guess that's a giant metaphor. The original print version of this article was headlined "A Day in the Life"